Reggie Mantle is the biggest jerk in Riverdale, but the new Reggie And Me series looks at the villain from the perspective of a creature that loves him unconditionally: his dog, Vader. Dogs are very popular point of view characters at Archie Comics right now, but having Reggie’s dog as the narrator of his book makes more sense than using Jughead’s pet Hot Dog to narrate Betty & Veronica. Vader knows that his owner is a creep, but he still adores him because that’s what dogs do, providing a valuable ally for the universally disliked title character. Writer Tom DeFalco is an industry veteran who got his start working at Archie in the ’70s, and he returns to the publisher to flesh out Riverdale’s nastiest bully. Teaming up with artist Sandy Jarrell and colorist Kelly Fitzpatrick, DeFalco finds a middle ground between the tone of classic Archie Comics and the modernized take on Archie characters that began last year, and this preview of this week’s Reggie And Me #1 showcases that balance as it introduces the lead and his canine companion. 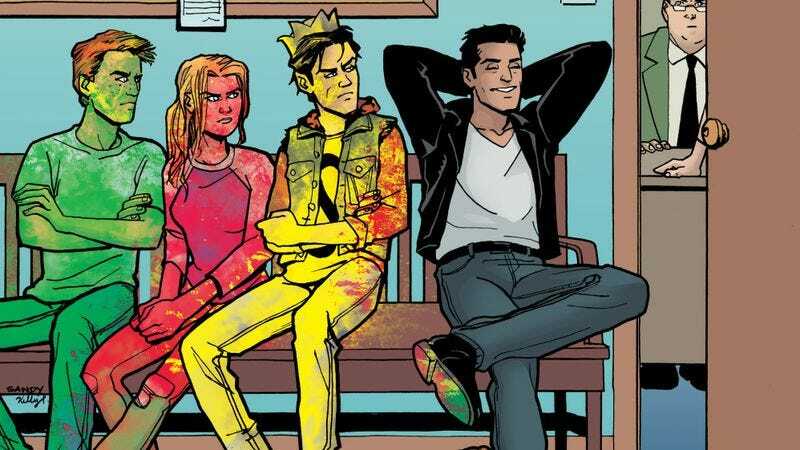 The character design in the revamped Archie line is much more varied and specific than what came before, and Jarrell’s artwork reflects that attention to detail with the wide array of fashions on display at Reggie’s party. Fitzpatrick’s colors maintain the bright palette that has been a big part of the Archie aesthetic, but there’s more texture and dimension in her rendering, bringing additional depth to Jarrell’s linework. Jarrell and Fitzpatrick have done exceptional work together on DC Bombshells, and it will be exciting to see how that creative relationship blossoms with an extended stay in Riverdale, working with a writer that has a deep familiarity with these characters and their world.